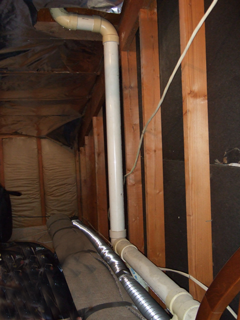 There can be powerful advantages in using a roof vent to access your main sewer drain when removing a difficult clog. There are also extra precautions needed, as we’ll discuss in this article. The vertical drop as the jetter hose travels down from your roof to the main sewer line can give you a powerful gravitational boost and the potential to reach the clog faster. 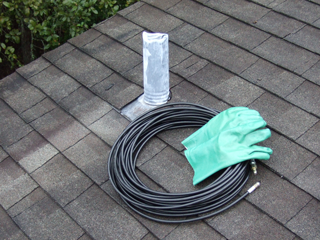 Roof vents generally don’t have gas traps that introduce tight turns, so working from your roof might give you easier, unobstructed access to the main drain. Depending on the design of your roof and location of the vent, setup and cleanup can also be easier than using an indoor drain opening. Before you consider cleaning your drain from a rooftop, take into account the accessibility of the vent, condition of the roof, weather, and any other factors that might complicate the job. Do not try this approach if you have no experience working on the roof or aren’t comfortable with the procedure. Avoid working on wet or snowy roof surfaces. Wear rubber-soled boots or shoes, use ladders and other equipment that are in good condition, and use a roof harness if needed to assure your safety. You should also be aware that not all roof vents provide unobstructed access to the main drain. Like the layout in this photograph, some vent systems introduce several 90-degree turns and long intermediate runs between the rooftop opening and main sewer drain. Try to investigate the system from inside the attic before starting the job, and if you see more than one or two 90-degree turns consider the alternatives of working from your main drain cleanout or sewer jetting indoors. Once you have determined that a roof vent might give you unobstructed access to the main drain, a pressure washer sewer jetter is a good choice for the job. That’s because your pressure washer can stay at ground level, with only the relatively thin, high-pressure hose and a trigger gun required on the roof. Be aware that you may need a high-pressure extension hose if the existing hose to the trigger gun can’t reach from the ground to the roof vent. You will need assistance from someone at ground level to stay near the pressure washer and feed high-pressure hose, guiding the hose to avoid snagging it on gutters, flashing, and other objects that could damage it. Throughout the process you should carefully position the hose so that it cannot pull itself to the ground, remaining cautious not to trip or get snagged on the hose lines as you move about the roof. While starting from your roof won’t solve all plumbing problems, at least one Clog Hog customer story comes from a property manager who was unable to clear an especially difficult clog with other techniques, and got the results he needed by working from a well-placed roof vent.